The document we received contained a hand-drawn organizational chart. The version above is our reproduction. (a) North Carolina limited partnership. (b) Panthers GP, LLC is general partner with a 46.8154% interest. (c) Carolina PSLFC, LLC is the limited partner with a 53.1846% interest. (d) Owns 100% of Panthers Football, LLC. 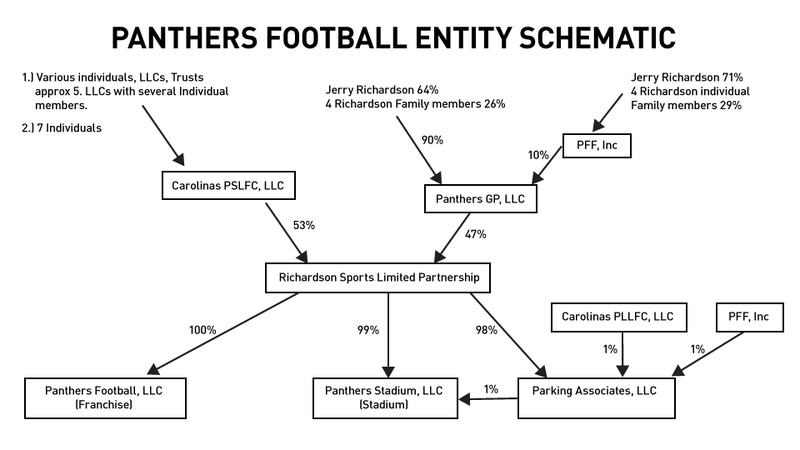 (e) Owns a 99% common membership interest in Panthers Stadium, LLC. (a) North Carolina manager managed limited liability company. (b) RSLP owns 100% of membership interest. (c) Jerome J. Richardson and Daniel B. Morrison, Jr., are the managers. (a) North Carolina manager managed LLC. (c) Owns a 46.8154% general partnership interest in RSLP. (d) Jerome J. Richardson is the manager. (b) JMB Football, LLC (owned by the Estate of John M. Belk, Claudia Belk, Mary Claudia Belk Pilon and the John M. Belk Trust f/b/o the Children of Mary Claudia Belk Pilon) owns 5.1945%; The Big TomKat, LLC (owned by Katherine McKay Belk, Katherine Belk Morris, Thomas M. Belk, Jr., H.W. McKay Belk, and John Robert Belk) owns 4.5720%; H.C. Bissell owns 4.8833%; Erskine Bowles owns 1.8353%; DSC Football, LLC (owned by Derick S. Close and the DSC 2007 GRAT) owns 9.7666%; Close Football, LLC (owned by Elliott S. Close, Frances A. Close, Crandall C. Bowles, Katherine A. Close) owns 9.7666%; Cameron M. Harris owns 2.4416%; John W. Harris owns 1.9533%; Donald R. Keough owns 7.8133%; Levine Football, LLC (owned by Leon Levine, Sandra Levine and Amy Beth Levine) owns 19.5331%; Jerry L. Wordsworth owns 16.1202%; and Steve A. Wordsworth owns 16.1202%. (c) Richard M. Thigpen is the manager. (d) Owns 53.1846% limited partnership interest in RSLP. (a) North Carolina S Corporation. (b) Jerome J. Richardson owns 70.7412% and Rosalind S. Richardson, Mark S. Richardson, Jerome J. Richardson, Jr., and Ashley R. Allen each own 7.3147%. (c) The Board of Directors are Jerome J. Richardson, Mark S. Richardson and Jerome J. Richardson, Jr.
(e) Owns a preferred interest and a 10% common interest in Panthers GP, LLC.